The historic handshake between the Queen and Sinn Fein's Martin McGuinness is the final confirmation that the era of 'never, never, never' politics in Belfast is over. It was the Rev Ian Paisley who used the 'never' phrase at the height of the Troubles. It came to represent the intransigence which dominated the politics of the time, on both sides of the divide. Would unionists negotiate with the Irish government? Would Sinn Fein sit in a Stormont assembly? Would an IRA veteran shake hands with the British Queen? The Good Friday Agreement, the de-commissioning of paramilitary weapons and the advent of stable, power-sharing government at Stormont are events most people in Northern Ireland thought they would never see. Looking back, it is still sometimes difficult to believe. Ian Paisley and Martin McGuinness - once bitter enemies - got on so well as first and deputy first minister at Stormont they were nicknamed the Chuckle Brothers. Now the Queen and Mr McGuinness have shaken hands. They do not have much in common. She is a monarch; he is a republican. She was born in a palace; he grew up in the Bogside of Derry. She is the epitome of the British establishment; he is a former IRA leader, the paramilitary group which killed her cousin Lord Mountbatten. Little wonder then when Mr McGuinness was asked on Monday what he was going to say to the Queen, he said he had not decided yet. When I asked him about the significance of the forthcoming encounter, he said: "It's another bit of history. It's about taking a risk for peace." The risk for Sinn Fein is that they could lose some party members, who believe no die-hard Irish republican should be fraternising with the British head of state, even it is just a "hello, how are you?" at an arts reception in Belfast. But the upside for Sinn Fein is that the move could increase the party's vote, particularly in the Irish Republic. Sinn Fein's refusal to meet the Queen on her groundbreaking visit to Dublin last year was out of step with the overwhelming mood of the Irish people. The welcome for the Queen in Ireland was extraordinary. Mr McGuinness is the deputy first minister at Stormont. Sinn Fein's goal is to be in power on both sides of the Irish border. The latest opinion polls in the Republic put their support at more than 20% - and rising. The party will be serious contenders at the next general election. 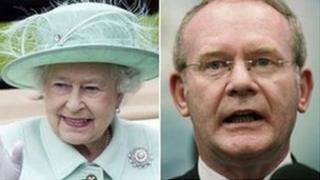 By meeting the Queen, Sinn Fein are showing that they can do diplomacy. Mr McGuinness clearly has grand designs. He said the meeting with the Queen would "give unionists a glimpse of what a re-united Ireland would look like". That is not how unionists see it. They regard it as another Sinn Fein compromise, and they are trumpeting the Queen's two-day jubilee tour of Northern Ireland as a rubber-stamping of their Britishness. In many ways, the episode sums up the peace process - both sides can claim victory. Either way, it is a landmark moment. So what is left to sort out in Northern Ireland? Only one major issue remains - dealing with the past, and the legacy of 30 years of violence. There are hundreds of unsolved murders and thousands of secrets but no agreed process on how to uncover the facts about what really happened. Dare I say it, never. There will be live coverage of the Queen's Diamond Jubilee visit at 14:45 BST on BBC 2 NI and BBC Radio Ulster on Wednesday, with live streaming online.